Celkon has launched Celkon A119Q Signature HD at price of RS 12,499 . Celkon A119Q Signature HD is Celkon’s first Quad core handset . So finally Celkon entered the race of Quad core smartphones . Celkon A119Q Signature HD seems to be very tough competitor for Zen Ultafone 701 HD & Micromax A116 Canvas HD as well . Really there will be lots of confusion specially for Indian customers while choosing an Budget smartphone . On the other hand its good too . There are some specs that sets Celkon A119Q Signature HD apart from other handsets . The device has 12MP rear camera & 3MP front facing camera . Celkon A119Q runs on Android 4.2 jelly bean OS . Celkon A119Q Signature HD runs on Android v4.2.1 jelly bean OS . Celkon A119Q Signature HD draws its strength from 1.2GHZ Quad core processor . The device has 1GB Ram & 4GB Rom ( internal memory ) . The mobile comes with 12Mp auto focus rear camera with led Flash & 3MP front facing camera . The display size is 5inches of 1280 X 720 pixels resolution . As all other Quad core handsets the device also has Dual sim capability . The A119Q is powered by 21oomAH battery . SAR value of the handset is Head: 0.795 W/Kg; Body: 0.813 W/Kg . Celkon A119Q HD has G-Sensor , Proximity Sensor & Light Sensor . The device has Accelerometer , 3.5 mm Audio Jack , Bluetooth v4.0 , GPRS, Class 12 EDGE , 3G Video calling, Wi-Fi 802.11 b/g/n & micro USB v2 connectivity options . Celkon A119q HD price is RS 12,499 & it is available online for pre-booking . 1.2GHZ Quad core handset . 1GB RAM & 4GB ROM . G-Sensor , Proximity Sensor & Light Sensor . 12MP rear camera & 3MP front camera . Below are some Competitors of Celkon A119Q signature HD . Zen Ultrafone 701 HD . Gionee Dream D1 ( Unboxing & review ) . 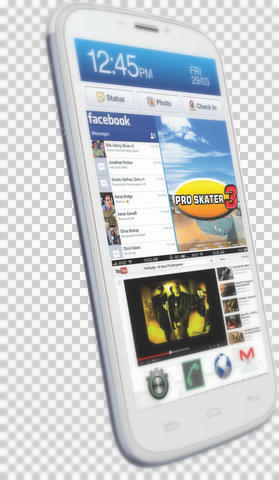 Micromax A116 canvas Hd . Alcatel One Touch Scribe HD ( Review) .